Long out of print and newly re-issued! 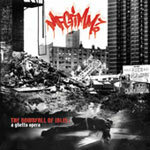 This is a sought after MF Grimm album, one that you reference when talking about him! Don't sleep this time around...word. Produced by: Count Bass-D, Metal Fingers, Dr.Butcher, dminor, Cas, DJ Eli, and Protest. Allsongs arranged and mixed by Metal Fingers. Additional vocals by MadamJaz and Allah's Reflection.